In the first part of this piece I traced the domestication and symbolism of the quail back to ancient history and also looked at my own first attempts to raise them organically. If you have just landed on this page and wish to go back to the start of the post then the link is here. It is now well documented that it was in the 1960s, when a rather tentative but brave volte-face away from the chemical love affair of the World War era began. This happened amongst private individuals, at the 'coal-face', where therapy by quail eggs began to make great strides in what has become known as 'alternative' medicine. Dr J.C. Truffier, who in his article; Approche therapeutique de la maladie allergique par ingestion d'oeufs de caille, La Clinique, 1978, 22, 2-4, (link at the end of this post) first gathered together a body of practical research, which had been carried out in the field by several individual French breeders of coturnix quail. One of them, Mr. R. Cordonnier, had progressively rid his wife of asthma, and chronic multiple allergies, including dust, feathers and dog hair, furthermore after curing her he had then gone on successfully to treat one of his employees. Another breeder, a Mr. R. Albert, had treated many of his friends also successfully for asthma and it was noted, despite the time-frame and degree of severity of the individual condition. Dr. Truffier continues in the article to document his own and subsequent peer research. It was on the strength of these 'lay' results, witnessed in 1967 by Dr Truffier, that he commenced his own clinical trials of quail eggs, the following year. He chose a panel of clinicians and an initial group of 800 patients suffering from a variety of conditions. For what he refers to as 'moral reasons', these latter were chosen from those with no option for treatment on the conventional routes. The conditions included; hay fever, rhinitis, spasmodic or convulsive cough, allergic conjunctivitis, prurigo nodularis, eczema, psoriasis, peptic ulcers and scalp allergies (these were treated with 'quail egg shampoo'). Later into the trials a further selection of patients were treated to include conditions, which were treatable under allopathy, such as asthma, certain squelae or chronic complication of hepatitis, migraine due to allergy and malnutrition. Although the Ancient Egyptians had prized both the medicinal and culinary virtues of the quail and both eggs and meat had been included for centuries in the medical vademecum of the Japanese and Chinese, the birds they had written of, were wild. It was certainly the case by the 1960s that decades of industrial agriculture had completely changed the quail's diet, their levels of stress and health. I was interested to note that Dr Truffier specifically mentioned in his article that the quail eggs he had used had come from a breeder whose quail were a mix of the wild and domesticated quail. In the 1960's these former could still be found in abundance in the Normandie countryside. In fact I'm happy to say our local organic dairy farm has them on its lands, even though my hunting neighbours swear they haven't seen them for decades and I'm keeping very quiet on the subject. Many people prefer to take quail eggs raw and thus get the benefit of the maximum amount of active ingredient within the white of the egg, i.e. what in 1960 was identified as the human trypsin inhibitor (ovomucoid). From what I have read however, there is no huge loss, ovomucoid is not significantly denatured, if the egg is only soft boiled for a short time and also if the egg is not newly-laid. Other ovoinhibitors and glycoproteins were identified in later studies but these too do not seem to be at risk from 'soft-boiling'. Andy didn't fancy eating raw egg, not because he thought it would be dangerous in any way but just because he didn't want to. In the end if the eggs had not worked for him as quickly as they did he would have consumed them raw. In Dr Truffier's experiments, he used raw eggs and for his original patients, with conditions such as hay fever etc., followed a protocol similar to the one we used by default. This consists of; six eggs per day for nine days, a lay off of nine days, then nine days more and if necessary nine days lay off and six more days of eggs. For his later patients, those with asthma, etc., he started them gradually with four eggs a day for the first three days, five eggs for the following three and six eggs for the final three days. In our case Andy just took the eggs for a week or so in total as we only had a few of our own young quail laying and we just ate all the eggs available. Thus consuming approximately eight eggs per day. In effect this initial treatment of eggs was enough to rid Andy of his allergies. 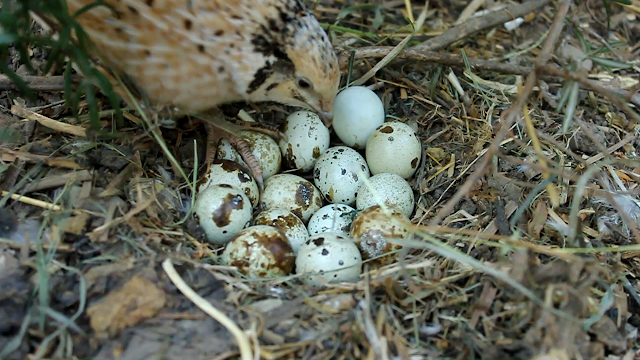 Our present quail have a natural cycle of laying a clutch of around eighteen to twenty eggs and then they stop. In recent years due I believe to a change in environment, i.e. a more permanently set up greenhouse area, they have begun also to make defined nests and go broody. The eggs Dr Truffier gave to his patients were given on an empty stomach first thing in the morning, as a medicine, ours were eaten on an empty stomach but as our lunch. At that time, we were eating a small breakfast but for some years now we have changed to a full English breakfast eaten later in the day. If we were to do this now, then I would probably consider eating them first thing on waking as a preprandial snack. Even though, I haven't been able to keep quail every year since 2000, due to the ravages of attacks from rats, from a nearby small broiler operation, now dismantled, Andy has never again suffered from hay fever nor eczema. The sceptics amongst you could imagine that the change of air to the seaside, the calm of rural France and our return to the land away from full-time and stressful employment, could have had something to do with his condition. We, however have always found that stress is something that tends to break out in the holidays and believed that we were actually doing something very stressful in coming here. We had both given up our careers and a steady income, sold a property, moved house and from Andy's point of view were now living in a country where he couldn't speak more than a few words of the language. To top it all, the garden and the farm lane outside the front door were both partly hedged with privet! With ever increasing allergy problems and respiratory conditions caused by pollution and food products, quail eggs have finally made it to the biotech industry and there are already products on the market containing dried organic quail egg. The paucity of information on the internet from seemingly an honourable mention in Ancient Egypt and Greece and a rumour from somewhere around 12th century Japan, has been much amended and added to over the last decade. According to recent uploads, apparently since Dr Truffier's first experiments, a new discovery on the virtues both nutritive and curative of the quail egg has appeared every few years since 1968. I will make an analogy with the hare, beloved of the Victorians for a roast dinner but never successfully raised by them or since in caged captivity. Despite this defeat, the hare was certainly partially replicated in the 19th century in the form of the Belgian Hare, an amiable beautiful creature but still in reality, a rabbit. Mrs Beeton, the doyenne of English cookery and who wrote the ultimate and iconic Book of Household Management, at the age of 21 in 1859, has often been pilloried for her labour intensive food preparation. To this day, in an era of microwaves and ready-meals, people will quote the erroneous 'first catch your hare...' as an example of how foolish it all is. I would conversely suggest that this misquotation goes to the heart and true nature of good food and cookery and ultimately good health and medicine. Preparing and raising quality food isn't easy but it is a great deal more challenging and satisfying than opening a packet. In conclusion I would say the quail egg is a nutritional powerhouse even just judging by the chick which emerges but unless you are very, very lucky to find an organically raised one and furthermore if you want to do as we did and stop sneezing and/or scratching, then first, hatch your quail. It you have enjoyed this blog and found it interesting then please think about subscribing, sharing it and/or commenting. Please also feel free to ask questions. Sue, Thanks so much for posting your experience with quail eggs. One question re: 'Not All Quail Are Created Equal" -- Do you believe that there is really a difference in treatment efficacy between wild quail eggs & Coturnix eggs, or were yours Coturnix and worked just as well? We've just moved to a home where we can have chickens & quail, & I'm wondering what type of quail to hatch. Hi Carlton, you are very welcome and thanks for your comments, they are appreciated! Yes mine are Coturnix Japonica although here in France the only wild quail we have are Coturnix too, (Coturnix coturnix). The simplest answer is 'Happy quail lay therapeutic quality eggs'. For me I achieved this by feeding my quail a good natural 'paleo' diet and also by providing an as near natural environment. It is true, though, that as my quail have begun to exhibit wild behaviours, it may be that my stock do contain some elements of wild quail genes. I do know that many breeders in Europe have bred back to wild quail in order to try and breed broodiness into their Coturnix japonica. However, as my quail were raised with a mother hen, who was very affectionate, it is just as likely, as they are bright little birds, that they acquired or reacquired their natural behaviour from her. So, yes, I would go for Coturnix japonica. I don't know if you've read my other articles or seen any of my You Tube films but they might be of use to give you an idea of some of the pitfalls to avoid in choosing your initial stock and the problems you can get with predators. Just like chickens, Coturnix are also very susceptible forming bonds with humans and can thus can become very tame, so be aware of this if you are thinking of eating them. Thank you for your article. I enjoyed it very much. I have had quail for over 4 years now but didnt really eat their eggs very often. I have a few questions, do I have to hatch them on my own for them to be organic or is it good enough to raise them from when they were bought at one day old? What kind of food do I feed them if not to use the game bird crumbles by purina from the farm store? Also, does everything I buy need to say it's organic or is non gmo good enough? Born on a farm in the UK with 3,000+ hens and 300 turkeys. Now in France with 30++ hens & cockerels plus pigeons and quail. 18 years ago we escaped from the madding crowd to create a forest garden home and to seek and find peace and happiness. 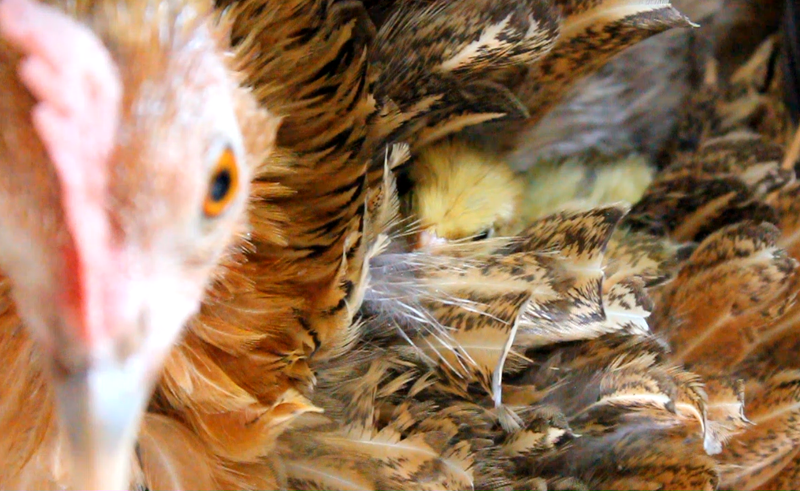 If you would like to support my writing, research and films then click on the image of Lucky and her chicks above to access 'paypal.me ' - Thank you. My Youtube Channel - Organic hens, roses, recipes and much more. The Holistic Hen is a participant in the Amazon Services LLC Associates Program, an affiliate advertising program designed to provide a means for us to earn fees by linking to Amazon.com and affiliated sites. 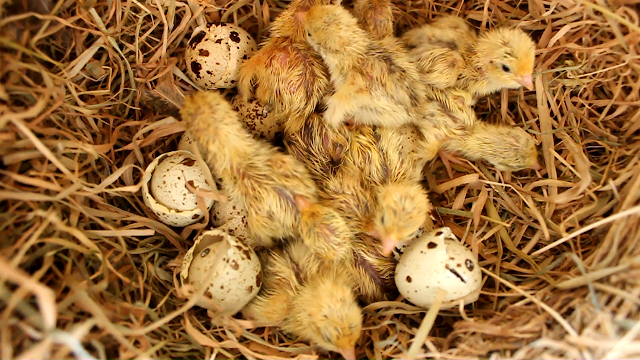 Hatching and Raising Quail Organically for hay fever and eczema - Part 1 - Breaking down the cage door. Treating Eye Problems & Facial Swelling - Homeopathy, Herbalism and Hens Part 1 Assessment, Observation & Techniques of Delivery. Choosing Chickens - Polish Crested - Beauty, Brains and Rusticity. One of my coturnix quail has gone broody and is sitting. A Fred and Ginger production!